The following comments come from a, highly experienced and senior, former insurance executive, who now works for one of the major Global Consulting firms. Obviously I wouldn’t name names without first gaining the approval of the individual in question but I really wanted to share my thoughts. After all that’s why I blog. For many years I have eagerly anticipated some meaningful debate with thought leaders, passionate or concerned people from within the insurance industry. But I have been, consistently disappointed. I wish I was more confident that these views might spark some meaningful discussion…but I won’t hold my breath! I think David Wilson is making the point that despite the results of the IBM survey, he’s seeing little action from the UK insurance industry. I think at the moment UK and Western European insurers have their hands full with Regulation – Solvency II, RDR – and this is diverting their attention. Even so, in terms of innovation, UK insurers (or at least Northern European insurers) are seen as leading the global pack in terms of capital effectiveness and optimisation, with the North American market looking to UK as an example of best practice especially in the area of risk management. capital effectiveness and optimisation – are these correct metrics for innovation and compliance? risk management – where is the evidence of “best practice”? – I see plenty of evidence of “bad practice” that has become ‘accepted practice’ across the industry. 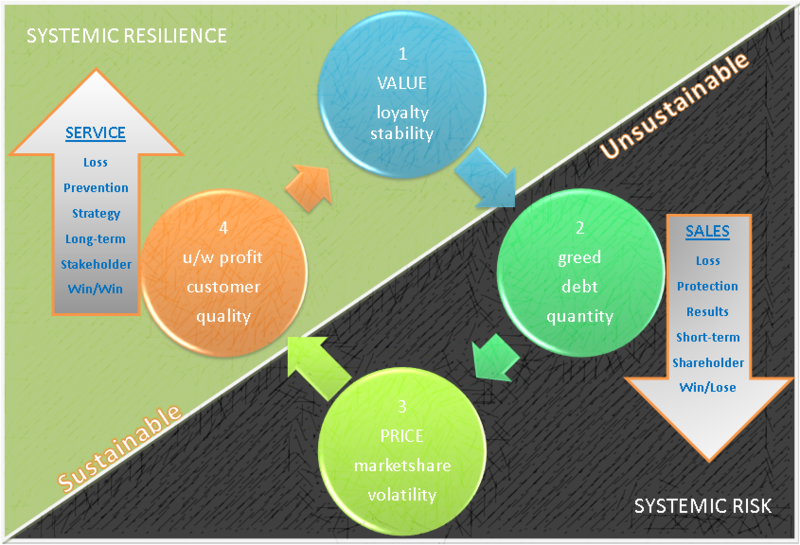 What are current practices in relation to complexity, business resilience and systemic risk? Insurance and banking have convinced themselves that they have been/are innovative but, if this is true, why are they the least trusted and most complained about industries according to their customers? Does that not explain the perceived need for more regulation? Floods:: will the insurance industry redeem or condemn itself? individuals whose self-interest consistently supersedes the interests of their colleagues – clients – congregations – students – customers – members – citizens and IS the biggest threat to their own interests as well as our shared future! Do so and, whether insurer or insured, you may be well on your way to coping with or avoiding nasty issues that impact both wealth and health. I’m sure that most people will be shocked by this story but, for me, it is the back-story of the claim culture, the role of the insurance and secondary industries that it “feeds”. Sooner or later we realise who the victims are! You may already know that the Government have already sought to shake up civil justice related to the “no win no fee legions”. So we have a “dysfunctional” motor market…or is that just the tip of the iceberg? MY point is that, whilst steps are now being taken to tackle this problem the fact remains that, as usual, it is the “customer” who foots the bill. Sadly, it is a similar story when it comes to dealing with household claims, except that the lawyers have been replaced by insurer-sponsored Repairer Networks and nationwide franchise operations. Their interest is in recovering the margin (and more) – squeezed out of them by insurers in return for “approved repairer” status – by cutting corners or inflating reinstatement or repair costs on multiple claims. Both of these scenarios are “extensions” of the practice – that has exploded in the commercial insurance market in recent years – of paying brokers excessive and unsustainable commissions to sell and service their products. Insurers are so desperate to maintain GWP that they will forego underwriting profit in its pursuit! A morally corrupt corporate culture. Insurance innovation: an oxymoron stuck in 3rd! The transition from 1 to 3 was relatively straightforward because greater operational efficiencies and product commoditisation enabled insurers – and brokers whose aspirations matched theirs – to sell more by reducing pricing and increasing commissions. So, as retention rates declined, an industry that, since its earliest days, thrived upon trust, loyalty and stability chose to spend increasing amounts on marketing and sales that promote – even reward – disloyalty and volatility!